"Overall I had a very positive experience with The Morgan Team. I was able to go from knowing nothing about the home buying process, to completing a home purchase in the desired part of town. The transaction was easy and without incident. 6 ½ years later I am happy in my home and will use the Morgan Team again." "I loved working with this team. Always a kind smile and kindness. I feel part of their family for years to come. They always went out of their way to teach me the logistics of all the paperwork." "Diane and Leah work really well as a team. If Diane wasn’t available, Leah was willing and able to assist. The Morgan Team is Awesome!" "I would recommend The Morgan Team to everyone I know. Their cheerful, positive, always there for you attitude was a huge encouragement to us as we waited for the house to sell." "I have only every used Coldwell Banker to purchase a home and Leah and Diane did not disappoint. Even when I wasn’t sure I was going to purchase a house, they took the time to show me homes and help me learn about the housing market in Boise. Once the process was underway, Leah & Diane kept me fully informed on what was happening and all things I needed to be looking for and were extremely prompt in dealing with any issues that arose. I always felt they had my back and were looking out for my best interests, and I know I got the best deal possible thanks to their efforts. I am a CB client of life!" "Always on top of letting my husband and I know what’s going on. We couldn’t be more happy!" "Joyce is always excellent and strait with customers regarding positive and negative aspects of properties. The process was excellent; she respected our budget and preferences." "They are the most OUTGOING, FRIENDLY, POSITIVE, KNOWLEDGEABLE & PROFESSIONAL real estate people I have ever worked with. . . and I have bought 5 houses and sold 4. I will NEVER work with another real estate team (and neither will anyone else in my family)." "Diane and Don were with us every step of the way. I feel they went above the call of duty for us. I would recommend Diane and Don to anyone buying or selling property." "We had worked with one other realtor before turning to the Morgan Team. Our previous experience lead us to believe that all realtors were dishonest, but when we met Leah, all our opinions changed! She was remarkable! We found a perfect home with everything we were looking for exactly in our budget. Leah fought for us every step of the way. We love our house and we love the Morgan Team!" 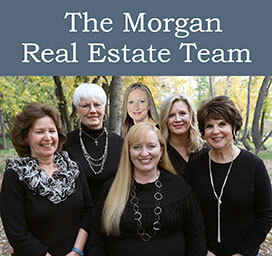 "The Morgan Team is exciting to work with. They work hard and deliver positive results. If people want to sell or buy they need to work with the Morgan Team!" "Leah Morgan is terrific to deal with. She is enthusiastic, explains things well and creates the feeling you are dealing with an outstanding processional. The process was great."